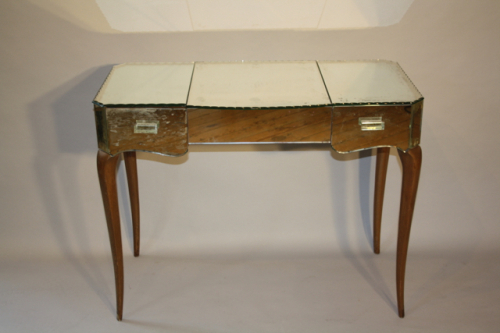 A delightful not to mention useful French 1940`s mirrored dressing table. The whole of the top part is mirrored in sections with scalloped edge detail. There are two drawers with glass pull handles and a central lift section lined with nicely aged distressed mirror glass and a clearer close up mirror. Some aging and wear as you would expect to the mirror glass as seen in close up pics but overall in a lovely condition and held steadily on wooden serpentine legs. A great classic piece.